Group chatting in messenger applications such as WhatsApp, Telegram and Facebook messenger makes it easier than ever to keep in touch with a group of people at the same time. In this tutorial we will build our own custom group chat application, aptly named “Chatly”. We will build Chatly using AdonisJS (a Node.js framework) and Pusher’s Chatkit Service, which makes it super easy to integrate 1-1 messaging and group chats into your applications. As at the time of writing this article, Chatkit is still in public beta which means we can try it out totally free of charge. Go to the Chatkit to sign up. Create a new Chatkit application and name it “Chatly”. On the next interface, select the Keys tab and you will be presented with your instance locator and secret key. We will need these later. The Chatkit documentation can be found here. AdonisJS is a simplicity first Node JS framework that has been garnering a lot of attention recently. AdonisJS comes packaged with a very helpful command-line tool that helps ease our development process. We will be making use of its latest version at the time of writing (4.0) to build our app. View the AdonisJS documentation and guide here. The above command will install AdonisJS command-line tools and make it available globally as adonis. The command will create a new folder called chatly in our current working directory. You should get a response similar to the image below. Execute the command below to start serving the application at 127.0.0.1:3333. 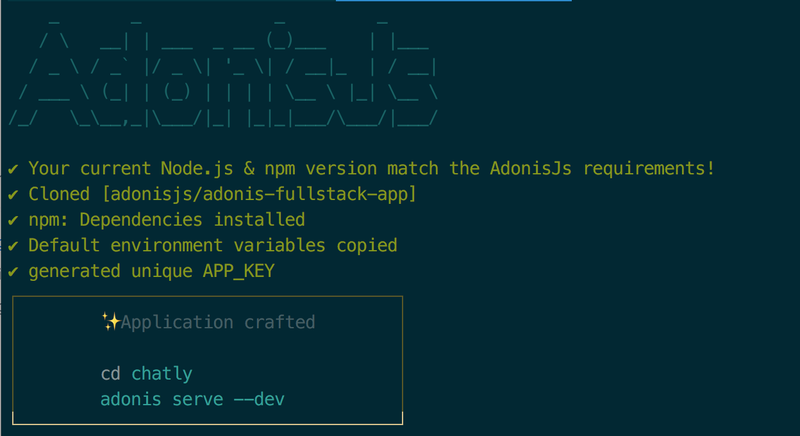 Now that we have a shiny new AdonisJS app, let us configure it to suit what we want to do. Open the chatly folder in your favourite text editor and edit the .env file. Create a database using your preferred relational database backend. We will use MySQL in this tutorial. Open up your .env file and edit the database credentials to fit your specific needs. You can find the documentation on migrations in AdonisJS here. What we do in the code above is initialize Chatkit using the instance locator and secret key we stored in our .env file earlier, then we create a ChatkitService class with methods for registering and authenticating a user. The registerUser() method accepts the following parameters: a unique ID representing a user, the user’s name and an optional avatar URL, while the authenticateUser() method accepts a request object (generated by the pusher-chatkit-client) and the ID of the user to be authenticated. Select For HTTP request when creating the controller. The Edge templating engine comes pre-packaged with support for layouts so we have created the main.edge file to serve as the default layout for our application. Layouts in Edge contain sections where templates extending the layout can insert content. The first block title has default content “Welcome” Inside it. The second is self-closing without default content. Next, paste the following code into the ./resources/views/login.edge file. In the code snippet above, we are extending the main.edge file we created earlier so the Login template follows the structure we have defined in the main layout. Based on the sections defined, we can insert our HTML code specific to each section. The routes file defines mappings from routes in our web application to the underlying functions that execute them. As you can see, we are handing over the actions that should be executed on each route to the controller functions since we don’t want to write all our code in a single file. Middlewares in AdonisJS are a set of functions that act on requests that are sent to the application. It comes in very handy for authentication. In the routes file above, we passed an array containing the auth element into the middleware function that encloses some of our routes. This tells the application to execute the auth middleware for any of the enclosed routes, which means that unauthenticated users will not be allowed access to the specified resources. They will instead be presented with an error page. At the top of the module, we are importing the ChatkitService, which we created earlier, and our User model. The showLogin and showRegister methods render login.edge and register.edge views respectively. The object deconstructing syntax in the login() method is used to extract the required values from the context supplied by AdonisJS to all routes handlers. The login() methods requires an email and a password, which we extract from the request object. We attempt to login using the auth module. The register() method creates a user with the supplied email, username and password, then proceeds to generate a random avatar using a nifty little snippet of code. The user ID, username and avatar are passed to the ChatkitService registerUser method which creates a user in our Chatkit instance. The token method verifies that the user is logged in then authenticates the user using the ChatkitService authenticateUser method. The result of this is a JWT Token that we would use in our frontend client to make requests to the Pusher API. As usual, we are extending the main layout template we created earlier by inserting HTML into the content and scripts sections. In the scripts section, we are importing the Pusher Chatkit client library and our custom chat.js file located in the public folder using the script global function from AdonisJS. Create a chat.js file in the public folder. Open the chat.js file and let us start integrating our app view with some Pusher Chatkit magic. Replace the value of the instanceLocator with the one we created earlier. The userId value is obtained from a hidden input in our frontend code (refer to the chat.edge file) that holds the user ID of the user currently logged in. 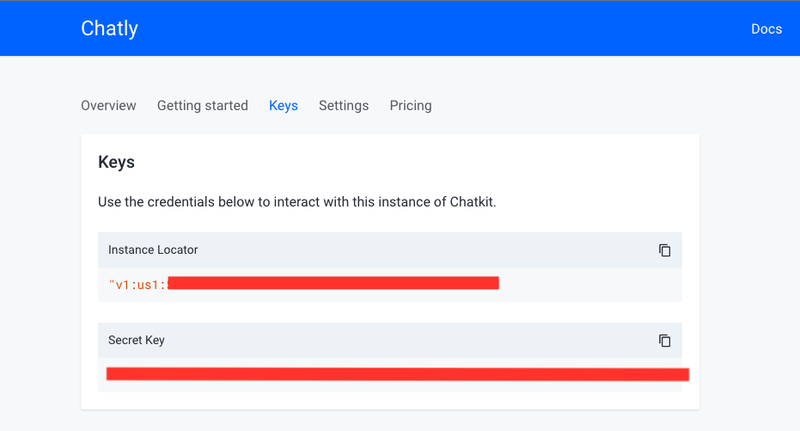 To get the user details, we need to connect to the Chatkit service using the connect() method on the chatManager. Before that though, let us create variables to hold the user, rooms and the selected room. The code above connects to Chatkit using the chatManager and assigns the result from the onSuccess callback to the user variable and proceeds to call the loadUserChatRooms() function, which we will define in a bit. We will define a function to get the rooms the user belongs to and all the rooms he is eligible to join. The loadUserChatRoom() function puts all the available rooms from the current user into the rooms variable we created earlier while avoiding duplicates. It also subscribes the user to all the rooms he is a member of using the subscribeUserToRoom() function, which is a wrapper around the call to the subscribeToRoom() method on the user object. Subscribing to a room means that the client will receive new messages as they are sent. The second parameter passed into the subscribeToRoom() method on the user object is known as the roomDelegate and lets us respond to events that happens in that particular room. As we can see below we have the newMessage and it is being handled by the handleNewMessage() function, which will be defined shortly. The function also pushes the list of available rooms to the view in the addRoomToList() method. // getAllRooms that the user is a member of and can join. "single-room list-group-item list-group-item-action flex-column align-items-start"
In the above code block, we are responding to the user clicking the createNewRoomBtn() on the Create Room Modal which invokes the createRoom() method, adds the room to list of rooms on the sidebar, joins the room if it’s public and subscribes to receive messages from that room. Note: You can only join public rooms, you need to be invited in order to join private rooms. The loadChatRoom() method updates the selected_room variable with the room that was selected by the user, then proceeds to fetch the last 20 messages in that room from chatkit servers and renders it using the addMessageToCurrentRoomView() function for each message. Earlier, we had subscribed to the newMessage delegate when listing the rooms, the handleMessage() function above defines what happens when we receive a new message, including the ones we sent. It serves at port 3333 by default, so you can visit 127.0.0.1:3333/register to register a new user and start chatting. Note: If you visit the homepage without being registered or logged in, you will see an error from AdonisJS. You can see how to fix that here. In this tutorial we have seen how to build a very basic group chat application using AdonisJS and Pusher Chatkit. The Chatkit service makes it super easy to set up a group chat application, as we have seen in this tutorial. The code for the entire tutorial can be found on Github.